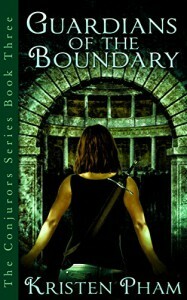 Guardians of the Boundary is definitely a wonderful teen book thats for sure. The level of writing and creativity has just tremendously increased from the first book in the series-The Society of Imaginary Friends. I've read the entire series, and it's just amazing to see how our heroine slowly evolves and grows up as the circumstances get worse for her. Valerie has always been on the more responsible side of teenhood, because everyone wants to off the poor thing. She's extremely special and she happens to be the one girl in the world that can stop the baddies from destroying everything. Besides all of that, Valerie grew up being an orphan and trusting people was out of the question. In this book, you see how much more trust she's putting into people and starting to unwind a bit with her friends. I received a copy from the author in exchange for an honest review. All opinions are my own.